Stems: Erect, simple, slender, glabrous below, very hairy above, arising from rhizomes with tuberous thickenings. Leaves: Basal leaves on stalks 1-4 inches long, deeply divided into 3 parts which are in turn divided into toothed or lobed segments, 1-6 inches long, 1-2 inches wide, glabrous or sparsely hairy; upper stem leaves in whorl at base of flowering stalk, mostly sessile, deeply dissected, about 1/2 to 1 inch long. Inflorescences: Solitary flower, 3/4 to 1.5 inches wide, terminal. 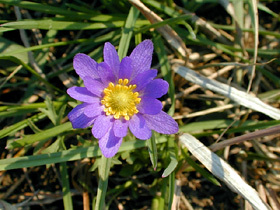 Flowers: Sepals petal-like, 10-27 in number, to 3/4 inch long, purple, bluish, or white; petals absent; stamens and pistils numerous, yellow, in central cylindric cluster. Fruits: Achenes, densely woolly, in elongate heads. Habitat: Dry, open prairies and pastures; gravelly or sandy soils. Distribution: East two-thirds of Kansas. Comments: The flowers open in the morning and close by late afternoon.